Make the first batch of batter. Cream together the butter and sugar until fluffy. Add the eggs, one at a time, and mix until combined. Add the baking soda, baking powder, vanilla, and salt and mix for about a minute, on medium high, until creamy (be sure to scrape down the sides of the bowl once or twice, to ensure everything is getting worked in). Then add the milk and flour, alternating between the two ingredients (to avoid lumps) until the batter is smooth and everything is well combined. Fill paper-lined cupcake tins so they’re about 2/3 of the way full (or a smidge more). Make a small crater in the center of the batter and spoon a heaping teaspoon of apple butter into it. Use the back of a spoon or your finger to gently spread a little bit of the batter over the apple butter (it’s okay if it doesn’t cover it all the way—the batter will back up and around the apple butter). Bake for about 22-25 minutes, until the cake is golden brown and set (it will bounce back when you gently press your finger into a cupcake). Allow the cupcakes to cool, while you make the buttercream. For the buttercream, whip up the butter to get it good and creamy. Then add the powdered sugar a cup at a time, scraping down the sides of the bowl between additions (to make sure everything is getting mixed up really well). Frost the cupcakes, then sprinkle with a little bit of cinnamon. 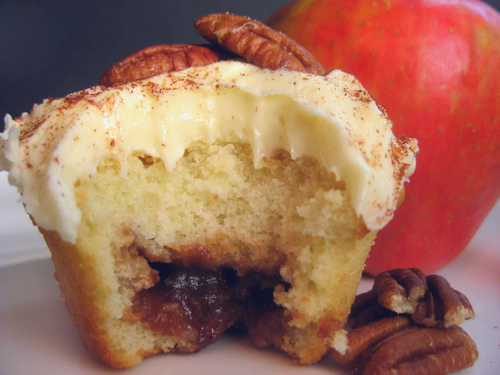 Top each cupcake with a toasted pecan or two.